There are three options, Medium Parchment (Beige), Light Graphite (Grey) or Dark Charcoal (Black). To see pictures of the car with the different colours, please look at the Interior Gallery. 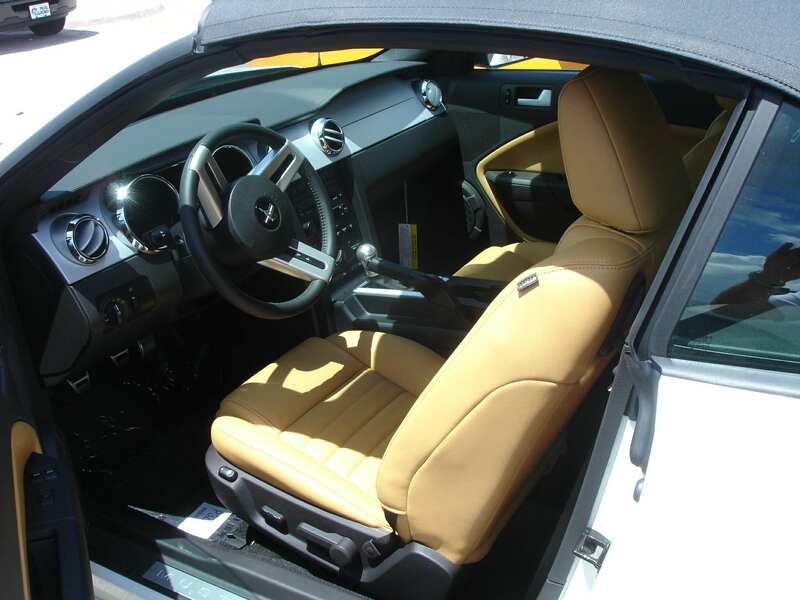 with "Red Accent Package" V8 "Interior upgrade package"
Also available as ICAP with "Chamois" - a much more rich, creamy beige-orange. 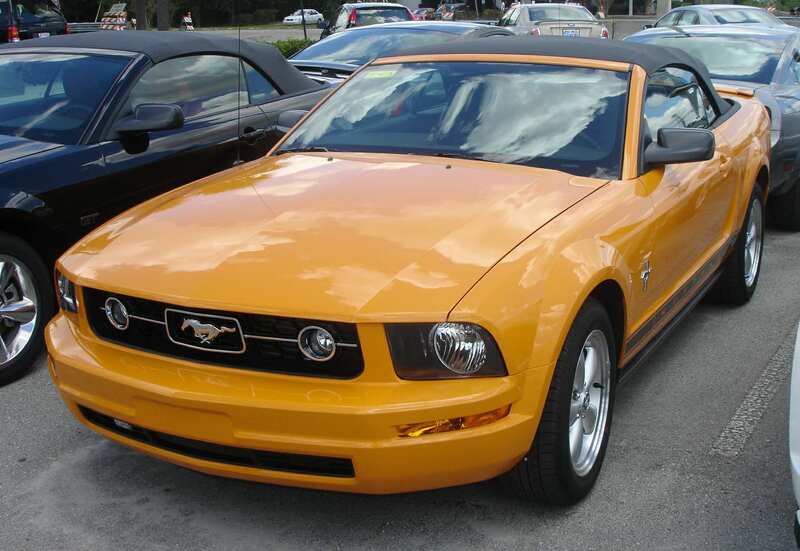 To make the V6 appear much more sporty, a cost-effective package has been added for 2006. This gives the previously dowdy V6 a highlighted grille with integral foglamps, some chrome details around the "running horse" logo in the centre. 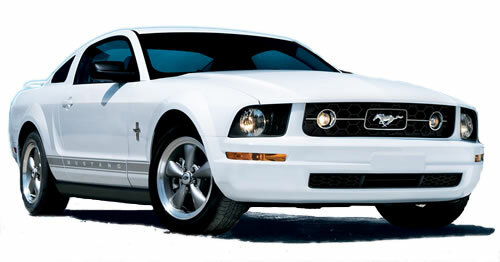 Also in the Pony Package are the 17" wheels previously standard on the V8, and a rear bootlid spoiler. Traction control coupled with the suspension settings from the GT make the V6 a far more engaging drive. For those who want a subtle lifting of the cabin ambience, the Sport Appearance Package is the one to go for. With aluminium details on the gearshift (manual or auto), and steering wheel the overall effect is very pleasing, particularly with the light graphite interior (shown, middle picture). The interior upgrade package lifts the cabin ambience significantly, this is best illustrated in the following two photos. Every single interior shot on the Ford website (and elsewhere) has this upgrade, so many people assume it is standard - it isn't standard, however it is excellent value at around £325 (price fluctuates depending on exchange rate). This is shown in the above picture on the right with a Dark Charcoal interior. The ICAP is only available with IUP and Dark Charcoal, which provides a very pleasing constrast for the red leather with black details. This picture below shows this Red combination in a Manual V8 Convertible. 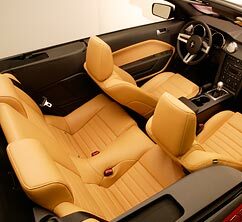 Also available is the Chamois ICAP, shown here (in bright sunshine) on a white V6 manual convertible, and also a studio picture (much closer colour reproduction).